Isn’t this a marvelous truth? There is no God, but the one true and living God who can make this claim. I am thankful for all the Lord does for us – way more than I could ever dream. He doesn’t just answer prayer but He goes above and beyond our expectations and He alone gets all the glory! Recently, we have had a *huge prayer request answered and it is so amazing to me! 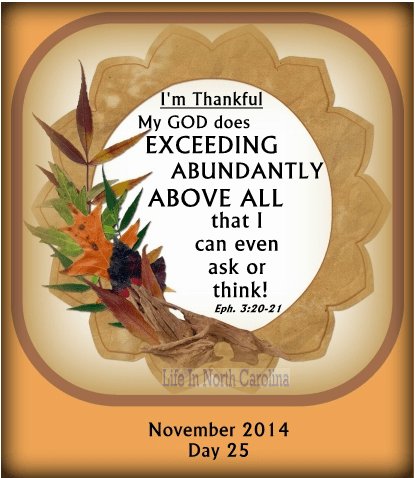 I never would have thought it – oh yes, He goes above even what we can think! How amazing is that! What has God done for you recently. Whatever He does for us is more than we deserve and the greatest things He has done for us is laid down His life so that we in turn could have the gift of eternal life. Praise be to God! O! how narrow, short, and poor are our prayers, compared with the power of God! It is much that the tongue can ask; it is more that the mind can think: but the Lord is able to do for us, not only above what we can ask, but abundantly above what we can think. Lord, what an everlasting spring of comfort is this! what encouragement doth it administer to thy people! what encouragement to prayer! what encouragement in prayer! They pray to him who is able to do exceeding abundantly above all that they can ask or think.